wheatgrass seeds for sprouting - hard red winter wheat. Great for refilling your wheatgrass kits, baking into sprouted grain breads. - Wheatgrass Juice is one of the best sources of living chlorophyll available today. However, to get the full benefit, the chlorophyll must come fresh from a living plant. - Wheatgrass juice is an effective healer because it contains all minerals known to man, and vitamins A, B-complex, C, E, l and K. It is extremely rich in protein, and contains 17 amino acids, the building blocks of protein. - Wheatgrass juice contains up to 70% chlorophyll, which is an important blood builder. The chlorophyll molecules closely resemble that of the hemin molecule, the pigment which combines with protein to form hemoglobin. The major difference is the chlorophyll molecule contains magnesium as it's central atom, and the hemin molecule contains iron. The molecular structure of these two substances is almost identical in all other respects. - Chlorophyll contains enzymes and super- oxide dismutase, a copper-containing protein found in mature red blood cells. This enzyme decomposes superoxide radicals in the body into a more manageable form, thereby helping to slow down the aging process. 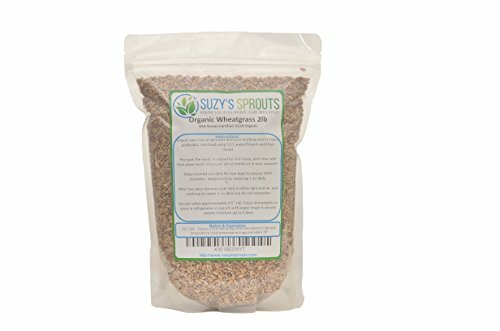 If you have any questions about this product by Suzy's Sprouts, contact us by completing and submitting the form below. If you are looking for a specif part number, please include it with your message. Barenbrug Kentucky 31 Tall Fescue Grass Seed 1000 Sq. Ft. Polybagged 5 Lb. Crocosmia Lucifer (10 Bulbs) drought-tolerant, zones 6-10.